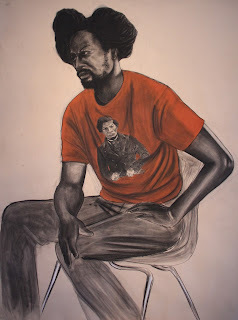 On September 17, 2011 Robert Pruitt's "You Are Your Own Twin" opened at Hooks-Epstein Galleries. It runs through October 15, and follows his equally strong show "The Forever People," which debuted just under 2 years ago and which Robert Boyd reviewed here. Normally, I don't print entire artist statements in my blog entries. Doing so dispels the illusion that I somehow know more or could deduce more from the artist's work than someone who hadn't read the statement. However, because every review that I've seen about this show basically plagiarizes it, I figured that I'd just provide it. The work has always trended towards W.E.B. Du Bois' notion of "Double Consciousness". This exhibition is a further consideration towards that concept. You Are Your Own Twin takes as a departure the many ways this division has been expressed through dress style, and specifically how we supplement this appended identity through science, history, and culture. 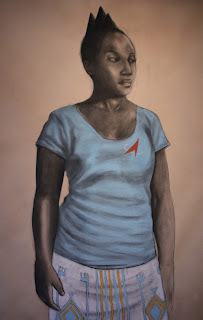 I am looking at traditional African ideas of twin veneration, family lineage, costuming, artificial intelligence, and other ways we envelop our selves within divided perceptions of self. The works in this exhibition are portraits of people existing in flux. These figurines modulate between themselves and some higher notion of being. That being said. Pruitt does exactly what he said he would in it. In "And Last Night Fredrick Showed Up", the figure wears his veneration for Fredrick Douglass on his chest and as part of his personal style. Pruitt does more than hint at a characters family and\or cultural lineage. He outfits them with it. In "Steeped", a queen stares down at the viewer, with haughty pride, bearing her own pyramid instead of the stereotypical water jar or basket of cassavas. The figure in "Outta Sight" proudly wears her love of science fiction, abstraction and primitivism. Even in the smaller black charcoal on paper pieces, Pruitt teases out the twin. The symbols that he affixes to his figures subtly confront racial and ethnic. 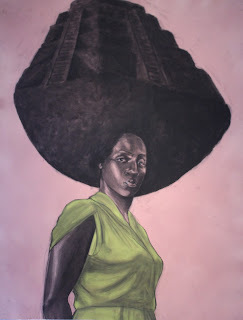 The spaceship hair piece in the Afro of the figure in "Enlightenment" goes against cultural stereotypes. What draws me into these is the individualism of each piece. Beautifully rendered, each is sumptuous and smart. Pruitt sensually sculpts his figures on paper. Then he blends pop-culture, history, ethnic traditions by affixing symbolic props\artifacts to the figures. It sounds like Paris fashion-show kitsch, but somehow he pulls it off. The figures bear themselves with an easy dignity that quietly declare 'I am one with my twin' no matter how seemingly disparate that those divided characteristics are. For me, the power of this show lies in how Pruitt chooses to depict these twined selves. They are conscious of the stereotypes that they both inhabit and combat. Sometimes they contradict them. Sometimes they mimic them. Always, they are aware of them. In a political era in which many consider the question "of being black enough" relevant as some sort of litmus test for authenticity, Pruitt seems to have one upped them with his own litmus test to determine if we can ever be too divided and extreme, too bipolar, which is to say "can we be human enough"?